You can be assured of clean rooms, a secured building, Wi-Fi, a friendly atmosphere, with access to restaurants, boutiques, vehicle rentals, the best golden beaches, diving, snorkeling, banks, post-offices and many other nearby facilities. Whispering Palms is on the beach side, just seconds to the beach. 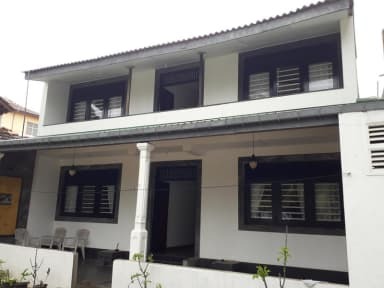 Whispering Palms - Tourist Rest & Hostel have 1 shared room with 4 beds, and 5 other normal rooms for individuals or couples. 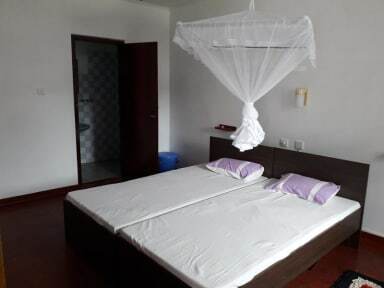 All rooms and washrooms are clean and modern, and include a fan and mosquito nets should you need it. There is also a closet to store your items and as well as a coffee table and 2 chairs. There is free parking in the front. There is also an area to put your feet up and relax at the back facing coconut trees and the ocean. This is a smoking-free guest house. If you enjoy smoking we kindly request that you do it outdoors. In general, we kindly request all guests respect the privacy and peaceful enjoyment of the premise.